Unless modelling a horse, human, gravity or cable powered line, there's a prime need for some motive power. Being very much a minority interest, British outline Nn3 has only two easily available loco kits which are both made by Peco (they call it N-6.5) - a freelance saddle tank and a Glyn Valley tram engine. 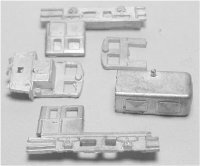 The kits are cast in white metal and are designed to fit on to the Marklin 8800 style chassis. Unfortunately, this is currently hard to find, either being out of production or only available in starter sets, according to whatever story is in circulation. The general layout of the kits is shown on the left. The saddle tank is really a freelance prototype but it does quite resemble the 2-6-0 loco no.109 that ran on the Ballycastle railway in Northern Ireland (I'm not sure of the exact prototype details, having only one photograph with a sketchy caption). Apart from the pony truck, the main different is that the Ballycastle loco has inclined cylinders. The enclosed tram engine is based on a Beyer Peacock design for the Glyn Valley Tramway in Wales, although the real thing was in fact 2ft. 4¼in. gauge. Incidentally, it's called a "tram engine" as the motion had to be enclosed for running alongside public roads and the loco had to "consume its own smoke" so as not to frighten the horses. As the bodies are appreciably heavier than the original Marklin BR89, the running is better and pick-up more reliable. Nevertheless, these are pretty small locos. The small images here link to larger pictures which include a ruler to get some idea of the size. Whitemetal is not a ideal material to work, it's quite soft, tricky to solder and clogs up files horribly. But it's in common use for a lot of UK kits so we have to make the best of things. These kits were assembled using Araldite, which is the original slow setting epoxy resin glue. While it takes 24 hours to cure, it's stronger than any other epoxy resin I know. It's also a very good filler of small gaps. Larger gaps are plugged using car body filler which sets fast and has good adhesion. Once the body is assembled, it's time to pay attention to the surface finish which can sometimes be a bit rough due to the crystalline nature of white metal. I use wet & dry abrasive paper for the initial clean-up, followed by polishing with a fingernail burnishing stick I then managed to mess up the nice smooth surface by spraying the locos with aerosol paint which has given them an orange peel finish which is horribly obvious in some photos. 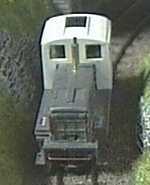 The next loco was a diesel, vaguely inspired by the Walker diesels on the West Clare line in Ireland. The basis was a Marklin 8864 diesel loco, from which the cab was removed and an N scale cab built up using plastic sheet and strip. When you do this kind of thing, it's important that the new cab follows the general style of the loco body, because then it looks a lot more convincing, as if the whole thing has been designed and built as one unit. Using the mazak Marklin body and a plastic cab, it's quite a bit lighter than either of the steam locos, but it still runs well. Anyway, I quite like diesels, as to me, they have plenty of character. My most recent project to hit the rails is a narrow gauge railbus. The Irish Turf Board have adapted a bus to run on 3ft gauge track, so I did exactly the same thing. Combining a plastic kit for a Bristol LS bus and a Marklin railcar chassis, the result is quite unusual, but accurate. The railbus has a coupling fitted at the rear end only to pull a small tail load. strongly suspect that being converted from a road vehicle, it'll only have a single reverse gear. The County Donegal railcars were like this and either ran back to back in pairs, one hauling the other or were turned at terminating points. Out of my stock of Marklin mechanisms, I have one 8800 0-6-0 left, and I have a kit for a German Feldbahn diesel which fits on this chassis but unfortunately, it's not that brilliant. I recently saw a made up sample at the Small & Delightful Narrow Gauge exhibition and it looked appalling, being badly made and on the wrong chassis, so that wasn't encouraging. However with a little bit of work, it does make up reasonably well. I'm not 100% sure of the prototype, but it's quite a chunky model. Discarding the cast roof and making replacement in using laminated plastic sheet in the same fashion as the diesel conversion above reduces the overall height of the model and improves the looks no end. A small problem is that it's too wide to pass the passenger platform on the Pizza, so this will have to be rebuilt. This loco has needed the most major surgery to the 8800 chassis so far, the chassis being reduced in length, the centre drivers removed from the axle and the valve gear discarded. All the spare parts go into the spares box for use somewhere else. So now I have 5 items of motive power, 2 steam and 3 diesel, so the infernal combustion engine has the upper hand right now. One more Marklin chassis is available, a track cleaning railbus, which is a pretty eccentric piece of kit and not actually very good at track cleaning. I shall probably cut this about a bit to make another railbus of some sort. After this, it will be down to scratchbuilding chassis, probably using 2mm Scale Association components, unless any more Marklin donor chassis turn up at swap meets or second-hand. In the Association, the split frame method is pretty universal. The chassis is electically seperated down the middle, frames, axles, everything. Thus the pick up is from the axle up through the frame then via wires to the motor. This is a good reliable system, there are no rubbing pickups to cause friction or collect dirt and although you might think that a lubricated axle makes a poor contact, that's not actually the case in practice. In lieu of any narrow gauge examples to date, here are some standard gauge chassis to illustrate the concept. This is a self-contained motor bogie with a 36:1 gear reduction. Bear in mind that the wheels are 6mm (just under 1/4") in diameter, so this gives it quite good slow running capabilities. The motor is from Tenshodo and is the same type as used in the HO gauge SPUD. I prefer these motors to the Faulhaber coreless type. They are cheaper, much more robust and respond well to feedback control. Most importantly, they have good low down torque. While this chassis is set up for 9.42mm gauge, it would be entirely feasible to adapt it to narrow gauge by using outside frames. This is a steam loco chassis, using the same type of motor but with a slightly different gear arrangement. In this case, the centre wheels are driven and then the drive is taken via the coupling rods to the outer wheels. This works well. It's actually easier to engineer than the commercial type of chassis where all the wheels are geared together and the motion is just really cosmetic. On this chassis the wheels are 8mm in diameter. The reduction in this case is about 48:1. 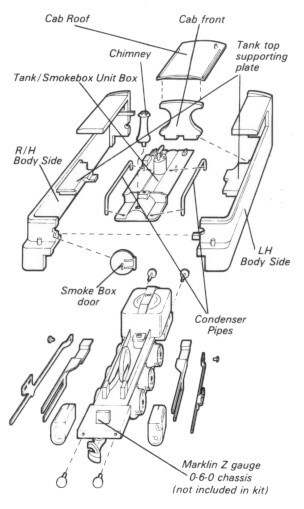 You can see a schematic diagram of how a split frame chassis goes together here. In both cases, all the components came from the Association mail order shop, and the frames and spacers I fabricated myself using nothing more than simple hand tools. Machine tools are useful as they make the job quicker and sometimes easier, but hand work is quite adequate to build a chassis. For more information on scratchbuilding components, follow this link.